To make the crossing sign, use the white foam poster board cut to size and then add letter stickers on each piece. Cross the foam pieces and glue with a hot glue gun. Then, cut a square piece of thick Styrofoam and clue one side of the foam piece to the baseball cap, the other side to the crossing you just made. 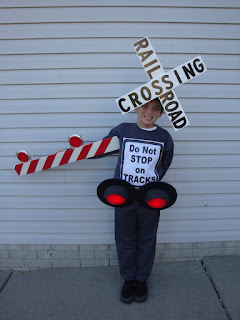 For the sweatshirt, I used white fleece and took it to a screen printer to have them print “Do not stop on tracks” on it. The screen printer suggested fleece instead of felt since the felt could melt in the process. I then cut strips of black fleece to outline the screen printed fabric so it looks like a “sign”. For the arm crossing, cut another piece of white foam board to fit the length of the child’s arm. Add red tape slightly at an angle throughout the length of the foam board. Hot glue the red reflector lights to the back of the foam board. Then, staple elastic to the back side of this piece so the child’s arm could slip in easily. For the lights, disassemble the tap lights so you have just the covers. Paint the covers using red acrylic paint. Cut two large circles out of the black foam (I used a large can of coffee as a stencil to make the circles perfectly round). Cut two smaller half circles to use as the “covers” for the lights. Once the tap light covers are dry, assemble the covers and be sure to include the batteries! Then, glue the large round circles to the back of each light. Then, place the ½ circle pieces on top of each light as a “cover”. Once the lights were complete, I attached the lights to a belt using elastic and staples. The belt made dressing up even easier!